Hi, I’m Oscar. I’m 10 years young. My previous people decided they didn’t have time for me, so the nice people at Pug Partners took me in. I’m so glad they did! I get love and attention all the time now. You see my previous humans just didn’t give me the care I needed. My nails were curled around into my pads of my feet, boy did that hurt. I let my foster mommy dremel them so they don’t ever curl back into my feet. I have a hard enough time walking because I have arthritis and when my nails were bad that just made things worse. I’ve been walking better already! I am completely blind and mostly deaf. I sometimes cry when I can’t find my people but am better once I know they are by me and I’m not alone. I have done well around cats, dogs, and kids. I do snore and am a very loud eater. I am pretty laid back though, and go along with just about anything. I walk really well on a leash, as long as we don’t go too fast. When we go for walks and I’m about to run into something my foster mom gives a gentle tug on the leash in the direction I need to go. At bedtime I like to find a comfortable spot to sleep. Sometimes it’s the big fluffy bed on the floor, sometimes I lay in the closet on the dirty clothes (they smell like my people) or I go to my kennel or sleep on the super big pile of toys that we have. They are so soft! Right now, I’m on a very special diet. I have bad knees and I need to lose 2 more pounds. My foster family is helping me to lose weight, but my forever family will have to make sure I don’t gain it back. As you can tell, I have a few health issues, but I have improved a lot since Pug Partners rescued me. Please don’t let my age fool you, I have lots of energy and life left in me thanks to these nice people. Interested in adopting? Oscar’s minimum adoption donation is $250. 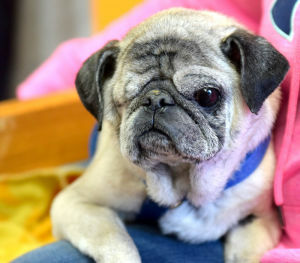 During March you can adopt Oscar or another senior pug (9 years or older) for $50 off their regular adoption fee.